Six days before the Passover celebration began, Jesus arrived in Bethany, the home of Lazarus — the man he had raised from the dead. A dinner was prepared in Jesus' honor. Martha served, and Lazarus was among those who ate with him. Then Mary took a twelve-ounce jar of expensive perfume made from essence of nard, and she anointed Jesus' feet with it, wiping his feet with her hair. The house was filled with the fragrance. Our sense of smell is powerful. It can attract us to something or repel us from it. It can excite or inhibit us. Most of all, it can deeply embed a memory and call it back powerfully to the surface of our emotions when the fragrance reappears. The situation in today's verses is one that will be anchored in the memory of all who were present. This story would be told and re-told by them every time they caught even the faintest whiff of the same aroma. 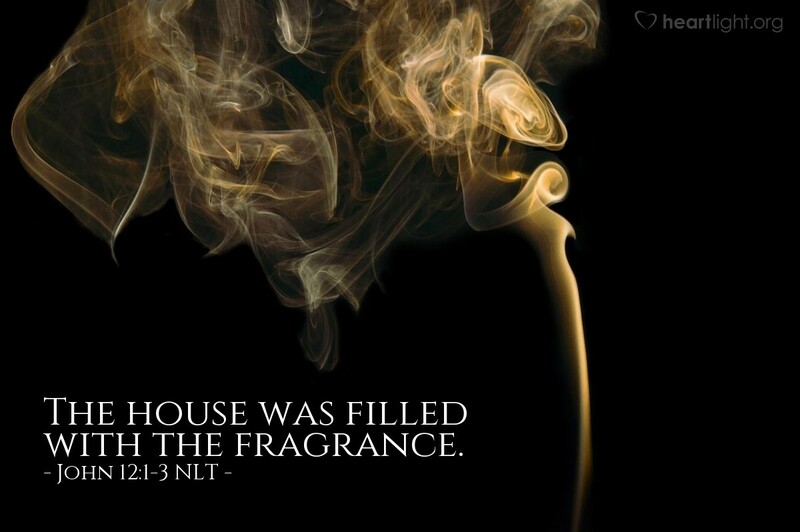 But more than just the literal fragrance, they would remember the beautiful aroma of extravagant love demonstrated by Mary. When we truly know that Jesus loves us and that he ransoms those we love from death, how can we not be extravagant in our display of love for Jesus? Let's be like Mary who was more concerned to display her love extravagantly for Jesus and less concerned about the criticism of those around her! Father, please forgive me. I confess that way too often my display of love for Jesus is passionless and predictable. I truly love and appreciate you, Jesus, for your unbelievable sacrifice and the victory over death that you purchased for me by your agony. O Father, help me to be less concerned about criticism from others and freer to show my love for my Savior. In Jesus' precious name, I pray. Amen.